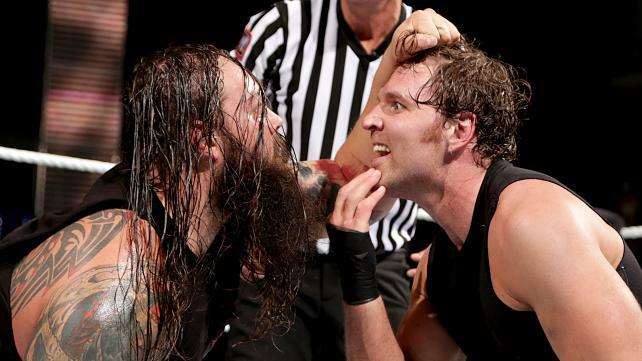 In early 2014, the two hottest stables of the modern era had begun their feud. Two NXT standouts were branding the WWE with their mark and setting fire to the paths behind them. They were here to stay and here to make an impact, some can say, bring "justice" to a flawed WWE. One clan had dressed up like homeless rednecks from the swamps of Louisiana. They were a family, not like the Brady Bunch, but more like Charles Manson's. The other militaristic group was dressed in matching black SWAT gear. They were a well oiled machine that was set to takeover. They are arguably the best faction in WWE history. These two factions were The Wyatt Family and The Shield, and their leaders were Bray Wyatt and Dean Ambrose. In a shocking conclusion to the best Hell In A Cell match of World Wrestling Entertainment's (WWE) PG Era, Dean Ambrose, Seth Rollins and the whole WWE Universe were graced by the eerie presence of Bray Wyatt. Wyatt had been missing off of WWE television for quite some time and with the increasing air time of his return vignettes, along with former Wyatt Family members Luke Harper and Erick Rowan, his return was imminent. Little did the WWE Universe know that his return would be at the American Airlines Arena at the Hell in a Cell pay-per-view. It looked as if Dean Ambrose had Seth Rollins reeling and was closing in on a certain victory when suddenly, the lights went out and the building turned black. After several moments of a distorted voice speaking in tongues, we see the lantern in the middle of the ring, illuminating a hologram. As a curious Ambrose stumbles towards the object, Bray Wyatt emerges from outside the ring and costs the Lunatic Fringe an all but sure victory over his biggest nemesis. With the reintroduction of Bray Wyatt, who at immediate glance and recollection looks even creepier and deadlier than before, the WWE has set up a rivalry that the Internet has wanted for months. You have Wyatt, the mysterious cult-like leader of the Wyatt Family and his disturbing presence with equally as disturbing and vivid promos on what he plans to do in the WWE. He is the Eater of Worlds and he is willing to go through anyone and anything, as long as he has the omnipresent Sister Abigail guiding him. Then, you have Dean Ambrose; everyone's favorite nutjob. He brings an unpredictability about him that the fans have come to know and love. His goal is the same as Wyatt's; to get to the top by any means necessary. While in The Shield, it is no secret that each of those men wanted to be "The Man" moving forward and the feud with Seth Rollins was only a stepping stone. After being betrayed by The Architect of the Shield, Ambrose made a vow to get revenge, by any means necessary. When you have two "crazy" characters that you do with Dean Ambrose and Bray Wyatt, there are some things that need to be avoided while booking what could be the best rivalry of the New Generation. WWE should NOT try to make these characters "out crazy" one another. It will lead to forced, uncomfortable segments that will take the WWE Universe out of the storyline. While it is clear that Ambrose will be the babyface and Wyatt the heel, it would be in WWE Creative's best interest to not attempt to blur those lines. If the line is crossed where the fans have to ask "Who should we be rooting for? ", then the storyline is in trouble. The use of Luke Harper and Erick Rowan will not only dilute this upcoming rivalry, it will also be a step backward for the newly minted singles competitors. Wyatt is his own man now. Ambrose is his own man now. Let that be. If WWE can stay away from these three traps, and I'm sure there are more by passionate Internet fan bases for both wrestlers, the feud could be done right. It is inevitable that Ambrose is going to be all kinds of riled up when he returns to TV. Whether that be the following night on Monday Night Raw or the next week, who knows. One thing is for sure. Ambrose will want/demand answers. Bray Wyatt, however, will remain his cryptic self. Why give away the master plan on night one? What I would love to see from Ambrose is not necessarily a man who is crazy, but who is driven for revenge. Instead of the antics used in the feud with Seth Rollins, Ambrose could turn his character into a cold, calculating, cerebral character. However, his recent run of unpredictability has enamored the WWE Universe, so I do not expect a major or even minor change with the Lunatic Fringe. With Bray Wyatt, since he has just recently returned, we will see what has changed or even stayed the same with the fedora wearing Southerner. There is no secret that these men have the incredible gift to cut memorable and engaging promos almost as if they're routine. Wyatt's delivery is more methodical and thought provoking. His vocabulary is large and is not afraid to show that he can create amazingly structured sentences. His subject matter is darker and ominous, although sometimes his promos do not reach the fullest potential they can in terms of following along or even creating a new storyline. Long story short; he rambles. Ambrose has a frantic delivery with a majority of his promos, but when he needs to buckle down and be serious, there is no one more engaging in the business. The rhythm on the mic is always spontaneous and you don't know whether he's going to scream or whisper or throw the mic into the tenth row. What makes Ambrose's promos stand out is the genuine conviction portrayed through his voice and his facial expressions. In the ring, both competitors have similar styles, but also have their own unique tendencies. Bray Wyatt is the more physical wrestler out of the two. Slow, deliberate and brutal are all characteristics of Wyatt's move set. The running crossbody block he uses is superb and can knock the wind out of anyone. Sister Abigail is as deadly a finishing maneuver as there is in the WWE to date. What separates Wyatt from Ambrose the most is his use of taunts in the ring. He will mouth off to opponents constantly and with that backward spider walk he does, his intimidation factor rises. Ambrose is unhinged. There is no fluidity to his move set, but what he does use is effective. He is the more technical wrestler of the two, using several submission holds that he owns in his repertoire. Ambrose, while faster and more technical, can brawl with the best of them. His uncontrolled fists, kicks and headbutts are tough to defend against, thus creating a moment of hesitation for the opposition as to when they can/will strike next. All in all, this rivalry is going to be physical and that's an understatement. Aside from what goes on bell-to-bell with these two, the promos are just going to be magical. They will be must see television each and every time their faces grace the screen and I for one am most excited about that. What this rivalry could turn out to be is still very much in the air, but needless to say, the expectation from the WWE Universe is sky high. WWE has two different characters that are talented both in the ring and on the microphone and that have a hunger to be the absolute best in the industry. If done correctly by both creative AND the performers, this could, potentially, turn into the most talked about and heated rivalry of the modern era. While Seth Rollins is the perfect counterpart to Ambrose in terms of a rivalry, Bray Wyatt could push Ambrose to his limits and the same can be said regarding Ambrose pushing Wyatt to his wit's end. Ultimately, this is the best rivalry for both men at the time. This is the best feud for the next several months. This is best for business. All videos courtesy of respective YouTube channels.